Please remember: The pattern booklets listed on this page are all over 50 years old -- they may be a bit fragile and will likely show signs of wear (which pretty much describes the rest of us who are over 50!) In fact, I would say condition ranges from "Wow" to abysmal -- I'll try to note obvious problems. ORIGINAL - Star Book No. 22: Star Book of Doilies, American Thread Co., ca late 1940's. Designs are not named -- Doilies in all sizes and shapes, including the popular ruffled doilies, tatted doilies, Luncheon Sets, Irish Crochet motifs, plain crochet motifs, Oblong Doily, Snow Flake Doiliy, Clover Leaf Doily, Wedding Cake Lace Doily. Also hints on using them for dress trims, bride's lacy halo and muff, tatted cap and doily frill, and more. Former owner's name in book, but otherwise very good vintage condition. REPRODUCTION - Star Book No. 22: Star Book of Doilies, American Thread Co., ca late 1940's, but this is a modern reproduction. Doilies in all sizes and shapes, including the popular ruffled doilies. Also hints on using them for dress trims, bride's lacy halo and muff, tatted cap and doily frill, and more. Tag residue on cover, but otherwise excellent condition. Doilies: Crocheted and Tatted, Star Book No. 44, undated but I'd guess mid - late 1940's. Some gorgeous doilies here. Very used -- cover torn, spine wear, some cross-offs and notes on patterns. However, all instructions are intact and readable, though the print is rather small. Star Book No. 59: Ruffled Doilies and the Pansy Doily, American Thread Co., 1948. 11 designs: Double Ruffle, Victorian Ruffle, Filet Ruffle, Square Ruffle, Tailored Ruffle, Star Ruffle, Irish Rose Ruffle, Bread Tray Ruffle, Shaded Ruffle, Pineapple Ruffle, Pansy Doily. Good used condition -- may have name on cover or light check marks by some pattern titles, general overall use wear. Star Book No. 59: Ruffled Doilies and the Pansy Doily, American Thread Co., 1948. 11 designs, from Double Ruffle to a bread tray. Definitely showing its age -- cover & page wear, Cover torn about 3" up spine, page yellowing & some spotting, some small notes. 2 holes punched in probably for binder. All patterns intact and clearly readable. Star Book No. 64: Flower Doilies, American Thread Co., 1949. Includes: Rose Hot Plate Mat Cover; Daisy, Forget- Me- Not, Irish Rose, Pond Lily, African Violet, and New Pansy Doilies; and Passion Flower and Wild Rose Luncheon Sets. Cover split at spine up to 1st staple, but otherwise very good condition. Star Book No. 71: Doily Bouquet, American Thread Co., 1950. Some wonderful designs, including two basic centers that are interchangeable with a Grape, Violet, Butterfly, or Holly border; a Spider Web doily, a Rose Ruffle Doily, Flower Bouquet, and Cameo Girl (4 "crinoline lady-type figures holding hands. Excellent vintage condition. Star Book No. 71: Doily Bouquet, American Thread Co., 1950. As above, but definitely shows its age -- cover split up spine, some pages partially split up spine, general cover and page wear. Star Book No. 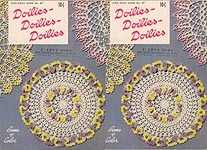 87: Doilies - Doilies - Doilies, American Thread Co., 1951. Designs include Pink and White Doily, Pretty Flower Doily, Yellow and Chartreuse Doily, Pink Pineapple Doily, Hairpin Lace Luncheon Set, Red and White Flower Doily, Gray Ruffle Doily, Spider Web Doily, Green Leaf Doily. Serious spine wear -- most pages torn almost all the way down spine; some torn completely down spine and detached from book. All pages are here and in relatively good shape, though. Star Book No. 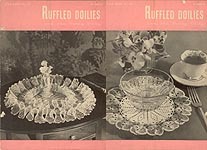 95: Ruffled Doilies, American Thread Co., 1952. Designs include Ruffled Doily in 3 sizes, a Tatted Ruffled Doily, a Round Ruffled Doily, a Tailored Ruffled Doily, an Oval Ruffled Doily, an Octopus Ruffled Doily, a Square Filet Ruffled Doily, and Round and Square Daisy Ruffled Doily. Very good condition. Star Doily Book No. 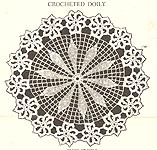 104: Doilies -- Crocheted, Hairpin Lace, Knitted, American Thread Co., 1955. Pineapples, Flowers, and Ruffles. Excellent condition. Star Doily Book No. 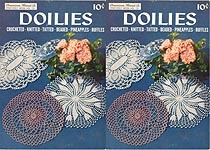 104: Doilies -- Crocheted, Hairpin Lace, Knitted, American Thread Co., 1955. Pineapples, Flowers, and Ruffles. Cover torn up and down at spine, folded lengthwise, marks on some pages. Star Doily Book No. 120: Doilies, Doilies, and More Doilies, American Thread Co., 1955. Includes: Pineapple Ruffle Doily, Wheat & Grape Doily, Candy Dish Doily, Knitted Pinwheel Doily, Crocheted Knot Stitch Doily, Multicolor Doily, Rose Doily, Pineapple Doily, and Nosegay Doily. Very good condition. Star Doily Book No. 120: Doilies, Doilies, and More Doilies, American Thread Co., 1955. Includes: Pineapple Ruffle Doily, Wheat & Grape Doily, Candy Dish Doily, Knitted Pinwheel Doily, Crocheted Knot Stitch Doily, Multicolor Doily, Rose Doily, Pineapple Doily, and Nosegay Doily. SERIOUS CONDITION PROBLEMS: just plain battered! Cover & page wear, folded in half, stains and writing on some pages. All patterns intact and readable (though some are difficult to read). Star Doily Book No. 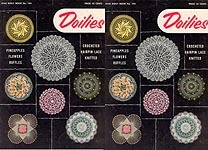 124: Doilies, American Thread Co., 1955. Includes: Oval Pineapple, Flowers (round doily), More Flowers (rectangle made with motifs), Green & Pink, Spider Web, Picot, Cluster Stitch, and Knitted (looks like a pinwheel). Definitely has seen better days; cover completely split in two at spine and off book (was taped on, but the tape apparently dried up and fell off), some splitting at seam. notes on one pattern. Still a lot of life left, though; patterns intact and clearly readable. Star Doily Book No. 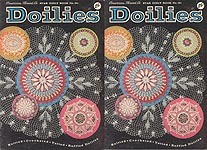 128: Doilies, American Thread Co., 1956. "New, easy- to- follow directions for crocheted, knitted, flower, and ruffled doilies." Small rip on front cover, page and cover wear. Star Doily Book No. 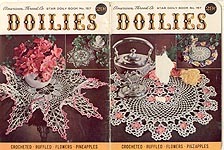 131: Doilies -- Crocheted, Knitted, Tatted, Beaded, Pineapples, Ruffles, American Thread Co., 1956. A bit worse for wear -- all pages detached from center staples, some cover & page wear. All pages present and readable. Star Doily Book No. 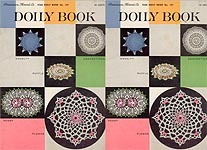 137: Doily Book, American Thread Co., nd. Designs include: Lily of the Valley, Pink Petal, Pineapples Large and Small, Double Pansy, Sailing Sailing (sailboats form the edging),Star Center, Gold Glory, Pert Ruffle, Fern Leaf. Some yellowish age- spotting on front cover; otherwise very good condition. Star Doily Book No. 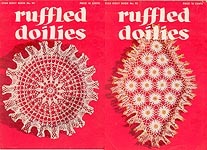 143: Ruffled Doilies, American Thread Co., nd (I'd guess maybe 1956 or '57). Patterns include: Blossom Ruffle, Tea Time Ruffle, Sunburst Ruffle, The Large Table Ruffle, Flower Ruffle, Sea Shell Ruffle, Yellow Bud Ruffle, Pineapple Ruffle, Small Pineapple Doily. General overall wear, back cover damage, does have some very faint, very old damp stains throughout. No musty smell that I can detect. Star Doily Book No. 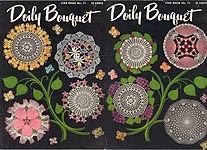 145: Doilies-- Pineapples, Flowers, and Sunbursts, American Thread Co., nd (I'd guess maybe 1956 or '57). Over 15 patterns, including some tatted and some knit. A nice variety, with interesting textures and color combinations; some of these are really gorgeous. Pages kind of wrinkly as if book has been sat on, spine wear. Overall good condition. Star Doily Book No. 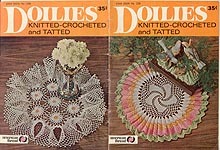 151: Doilies-- Knitted, Crocheted, Tattled, Ruffled, American Thread Co., nd. Patterns include: KNITTED Beauty; CROCHET Picot Picot, Papyrus, Pineapple Round, Forsythia, Autumn Wheat, Cathedral Window, Carnation Ruffle, Fluffy Ruffle, Simple Ruffle,Flower Chain, Pond Lilly, Star Point, Four Square, Rose Ring, Sea Scallop; TATTED Picot. Some issues at cover spine, one "dog- eared" corner of cover, but otherwise very good vintage condition . Star Doily Book No. 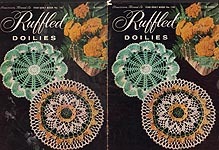 157: Doilies-- Crocheted, Ruffled, Flowers, Pineapples, American Thread Co., nd. Patterns include: Tea and Roses, Wild Rose Point, Ducks and Drakes, Dilly Doily, Rice Stitch Ruffle, Golden Goose, Flower Center Doily, Spring Time, Pansies Pansies Pansies, Pineapple and Fan, Motif Doily or Place Mat (can be enlarged to tablecloth), Sterling Picot, ROund or Pointed. Digest-size book; scar on front cover, about 1" tear at bottom of spine. Pages in very good condition. Star Doily Book No. 228: Doilies-- Knitted- Crocheted- and Tatted, American Thread Co., nd KNIT The Knitted Doily; TAT The Tatted Doily; CROCHET Daisy Ruffle, Beads Beads Beads, Motifs for Lunch, Pansies, Lily of the Valley, Oval Ruffled Pineapple, Wild Rose Ruffle, Sunburst Ruffle (ripple), Petal Cluster, Spider, Cosmos, and Daisy Rick Rack. Digest-size book in excellent condition -- doesn't feel like it has ever been opened! Star Doily Book No. 228: Doilies-- Knitted- Crocheted- and Tatted, American Thread Co., nd KNIT The Knitted Doily; TAT The Tatted Doily; CROCHET Daisy Ruffle, Beads Beads Beads, Motifs for Lunch, Pansies, Lily of the Valley, Oval Ruffled Pineapple, Wild Rose Ruffle, Sunburst Ruffle (ripple), Petal Cluster, Spider, Cosmos, and Daisy Rick Rack. Digest-size book in very good condition; may have slightly musty smell. Hand Crochet by Royal Society: Crisp New Doilies, Royal Society, Inc., 1948. Looks like an assortment of about 21 different designs in a variety of shapes and sizes, including some filet, a table runner, and a square table set made with motifs with 4 different sized pieces (plate doily, coaster, centerpiece, and placemat). Some cover & spine wear, but overall good condition for its age. 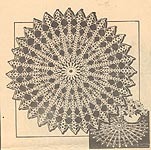 Crocheted Doily, One-page instruction leaflet -- no idea of date or publisher. Very pretty doily pattern that can be made in either bedspread weight or size 30 crochet cotton. Has been folded twice as if to fit in envelope, so this might have been an "extra" with one of the mail-order patterns, but the paper is of slightly better quality. 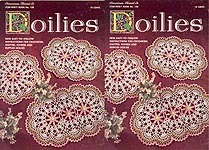 R 2595: Wheel Doily, vintage crochet pattern sheet that used to be offered via newspapers, etc. Doily measures 14" in diameter when worked with size 50 (yes, that is 5-0) crochet cotton. These are printed on thin paper and used to be sent through the mail in regular letter envelopes, so pattern does have mailing creases -- and shows its age slightly with discoloration. Laura Wheeler Design 614: Crocheted Doilies, Needlecraft Service, Inc., 1946. Vintage crochet pattern sheet that used to be offered via newspapers, etc. Instructions for pansy cluster center doily, worked in either bedspread-, size 30-, or size 50- weight crochet cotton. These are printed on thin paper and used to be sent through the mail in regular letter envelopes, so pattern does have mailing creases. Also slightly age- yellowed, but otherwise feels like it's never been out of its original envelope. Laura Wheeler Design 728: Crocheted Doilies, Needlecraft Service, Inc., 1946. Vintage crochet pattern sheet that used to be offered via newspapers, etc. Instructions for large and small doily, worked in either bedspread-, size 30-, or size 50- weight crochet cotton. These are printed on thin paper and used to be sent through the mail in regular letter envelopes, so pattern does have mailing creases. Also check marks by rows and very age- yellowed, so it might be a bit difficult to read. Laura Wheeler Design 763: Crocheted Doilies, Needlecraft Service, Inc., 1946. Vintage crochet pattern sheet that used to be offered via newspapers, etc. 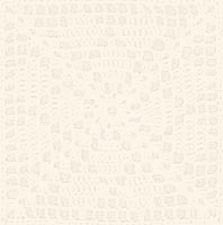 Instructions for large and small doily, worked in either bedspread-, size 30-, or size 50- weight crochet cotton. These are printed on thin paper and used to be sent through the mail in regular letter envelopes, so pattern does have mailing creases. Also somewhat age- yellowed, but otherwise feels like it's never been out of its original envelope. Laura Wheeler Design 980: Filet Crochet Doilies, Needlecraft Service, Inc., 1946. Vintage crochet pattern sheet that used to be offered via newspapers, etc. Instructions for large and small doilies. These are printed on thin paper and used to be sent through the mail in regular letter envelopes, so pattern does have mailing creases. SERIOUS CONDITION PROBLEMS: VERY FRAGILE -- yellowed, and splitting along foldlines. Instructions in VERY fine print, and extremely hard to read. Charts are readable. If this weren't such a beautiful Bird & Rose design, I'd just toss this one into the recycling! Dressy Doilies, American Thread Company, undated. One-page instruction leaflet with directions for three different doilies. VERY fine print. Has been folded in half, but in otherwise excellent condition.